During pregnancy, oxygen is as important to a growing fetus as it will be once the child is born and breathing fresh air. Oxygen from the mother’s bloodstream is transported through the placenta to the fetus but the placenta isn’t developed enough to do this until almost the fourth month of gestation. It has been believed that the yolk sac that forms around an embryo supplies oxygen but a new discovery indicates it is, in fact, the immature placenta that works like an embryonic oxygen tank, storing oxygen until it can be slowly released into the developing embryo. In the earliest days of pregnancy, a yolk sac forms around the embryo. Neither the yolk sac nor the embryo has a circulatory system to route oxygen-rich blood but the yolk sac absorbs oxygen from the mother’s blood supply and the embryo absorbs oxygen from the yolk sac. The human embryonic stage lasts until the eighth week after fertilization. After week 8, the developing baby has reached a more complex state of development, with organ systems now in place and developing. At this point, the embryo is recognized as a fetus. At about week 4, though, the embryonic heart starts beating but there is still no circulatory system. The gastrointestinal system begins development, too, and the yolk sac is eventually absorbed into the digestive tube. Until it is fully absorbed, the yolk sac continues to extract oxygen from the mother’s blood and transfer it to the embryo but is fully absorbed long before the placenta develops a mother-to-child circulatory system. 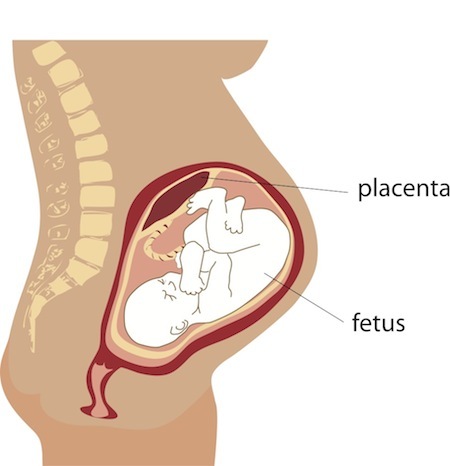 During this interim stage, the placenta is still developing, too, but is not fully functional. Its own circulatory system to route mother’s blood to the fetus isn’t functional until the end of the third month of gestation. Recent studies suggest the immature placenta is nevertheless associated somehow with oxygen transfer, gaining more importance to embryonic oxygen supply as the yolk sac ceases to exist. Aplin’s research team used samples from tissue banks for the study and Aplin attributes this valuable advance in understanding embryonic and placental development to new imaging technologies that allowed the researchers to detect for the first time the placental stem cell formations that allow for oxygen extraction and release between mother and child. “The work has been made possible by new approaches to imaging placental tissue which means that greater levels of cellular diversity and detail can be revealed. We’re now uncovering more and more information which gives us a better insight into earlier stages of pregnancy than ever before,” Aplin said. Aplin, John D., et al. "Hemangioblastic foci in human first trimester placenta: Distribution and gestational profile." Placenta (2015). Web. 19 Sept. 2015. PubMed. "Placenta’s oxygen tanks for early embryos revealed." Manchester 1824. The University of Manchester, 10 Sept. 2015. Web. 19 Sept. 2015.